OPENING DAY! 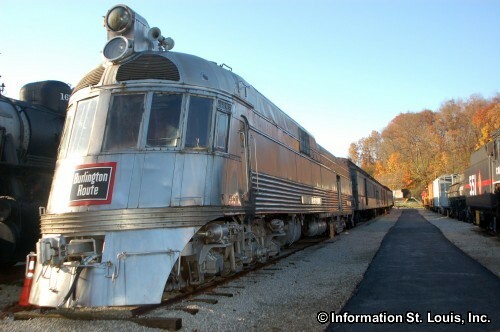 The E. Desmond Lee Holiday Train Display Exhibit at the Museum of Transportation opens Thanksgiving weekend beginning Friday, November 23rd running through Sunday, January 6th. The display features the former Downtown St. Louis Macys window display and can be visited during regular museum hours. Included with regular museum admission price. See website for more information. Closed Thanksgiving Day and Christmas Eve, Christmas Day, New Years Eve and New Years Day. The Museum of Transportation encompasses all modes of transportation. It all began in 1944 with the acquisition of a mule drawn street car and now the museum has the largest collection of steam locomotives in North America. Other collections at the museum include automobiles that range from a 1901 steam powered delivery truck to an incredibly rare 1963 Chrysler Turbine Car. Special activities and events happen at the Museum throughout the year. Santa and Mrs. Claus visit each Christmas season with other holiday activities. The Museum holds car shows several times a year that vary in theme of make and model. There is even a miniature train that visitors may ride as many times as they want. Directions: Located on Barrett Station Road, between Dougherty Ferry Road and Big Bend Blvd.